Notably lower ATK/DEF of opposing villains. Notably degrade co-op/raid boss's DEF, regardless of its daily weakness. 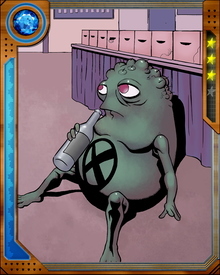 Doop is said to have been created in a Cold War biotechnology experiment. 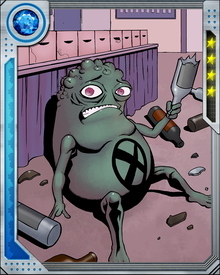 A roughly egg-shaped green creature with a large X-logo on his belly, Doop can vary his size, weight, density, and other physical characteristics. The only part of his body that cannot be manipulated, disassembled, and reassembled is his brain—which he values so highly he once fought Thor for just a small part of it. He has a second brain, but prefers it when both are fully functional.